I love snow and I’ve been wistfully following the flurries around the UK on the news, Twitter, blogs and Facebook, wondering if it will head my way. I have a section in my new cookbook listing things to do on snow days and I’m looking forward to doing them when I get my own snow day. Until then, I thought we could have a little food blogging event and you can send me pictures of the snow where you are so I get to see it, along with the lovely bakes you make. What do you think; sound like fun? To enter, all you have to do is bake something yummy and take a photo of the snow or frost and then blog about it, with a link back to this post. It looks like the winter chill is set to last so let’s set a deadline of 12th December and then I’ll do a round-up of all the snowy photos and bakes. I can’t wait to see them! 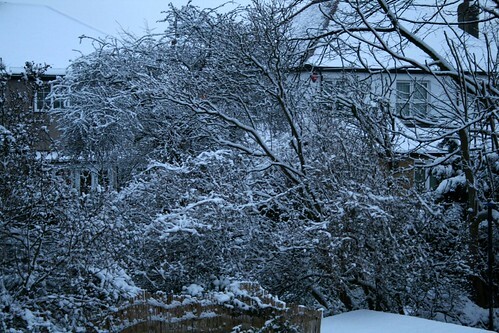 You can also post on Twitter using the tags #SnowDayBakeOff and #uksnow. Have fun! Oh, dear… I will have to wait for the Easter Bake since I am in Rome and we have no snow – not usually. It snowed for 20 minutes last winter and the whole province came to a halt! It was a steamy, wet, rainy 16C, yesterday! Ciao, and as always, thank you so much for the invite. Your last cooking event (in the bag) really inspired me so I look forward to the next one! Lovely idea!! Found you through Home Baked and now am following you on Twitter.LOve baking- check my blog if you want!! See you at the bake-off anf hppay first Advent . and enclosed a link to your blog and this link . I am in, just need to bake and get some batteries for my camera! Oooh I would love to take part – but I think I am in the only part of the country that hasn’t had snow yet! I hope a heavy frost will do otherwise! Oh definitely, me too! We have enough snow to share! Can’t wait to see everyone’s yummy wintery bakes! Hi Julia, Great idea, here is my entry, http://theordinarycook.co.uk/2010/11/30/ginger-cake/ . My fingers are frozen as I type! Do I still need to email or does this count as my entry? my partner is currently stuck in Lincolnshire in the house whilst I managed to get out before the snow came down… dont know if I wish I was there or not?!?! If I get back at the weekend i’ll make something for this little snowy challenge! Do I need to email you a link too? How fun! I wish it was snowing here in the southern part of the US. 🙂 You never know, though. Mother Nature may pull a fast one on us. Cheers! Hey guys. Wow, this is SO exciting! Don’t worry if you don’t have snow, you can use a picture of snow or frost from a past winter. Just published my snow post with a link back to the bake-off! We don’t have any snow in SF but I will be making some homemade Christmas cookies in the next day or two. Can I just include a rainy city scene instead? Here’s a recent post of ours for s’mores, just in case the snow becomes too much and you need some summer baking project. Jason – absolutely, rainy days are just as good as snow days for baking! Wow – this looks like being one popular event! Perhaps everyone is stuck at home baking instead of going to work? Hope you’re enjoying your snow! Hope everyone is enjoying the snow! Our snow is melting now – I just don’t want the ice to hang around for long! Thanks, this is a lovely idea. Here is my entry for the Snow Bake off – a Strawberry Curd Yogurt Loaf cake. The snow is starting to melt away now. Here’s my entry for Snow Day Bake-Off – chocolate cinnamon rolls. A bit last minute. Hope it’s not too late! Thanks a million – what a good idea!